Simple in form but elaborate in styling, this Apples of Gold gemstone ring is anything but ordinary. 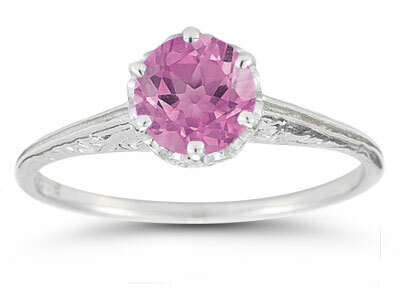 A single pink topaz gemstone sets the bold tone for this ring with its enchanting color and inevitable sparkle. The setting boasts six solid silver prongs that keep the pink topaz in place, while the vintage-style mounting holds the stone aloft. The band of silver brings the ornate style in check with just the right style of engraving for the ring. We guarantee our Vintage Prong-Set Pink Topaz Ring in Sterling Silver to be high quality, authentic jewelry, as described above.